It doesn't matter which experiment generator you use to run your computer-based Psychology experiments the Black Box ToolKit USB response box helps improve your millisecond reaction time (RT) accuracy in custom application or where a BBTK USB response pad cannot be used. Truly plug in and play as our USB response pad appears to your computer as a second keyboard and each external button press produces a standard key press! Accepts up to 4 high quality external buttons or hand-held triggers. Ask us for a quote now. Simply plug into a USB port on your PC/Mac/Linux system and our response box will appear as a second keyboard. Press an external button or other push-to-make switch and a standard keystroke will be sent to your experiment. No need for drivers, no need to recode! Works out of the box with E-Prime, SuperLab, Presentation, Inquisit, PsychoPy or any other software that can accept standard keyboard responses. 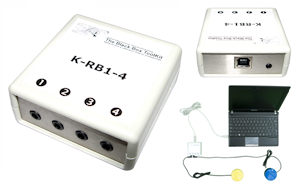 The K-RB1-4 response box is intended for custom applications where our 1-8 button USB response pad cannot be used. Up to four high quality push-to-make, or momentary buttons, can be connected via 3.5 mm mono jacks* Now includes single TTL out/TTL trigger socket for use with a BBTK v2 or mBBTK v2 (event marking version). 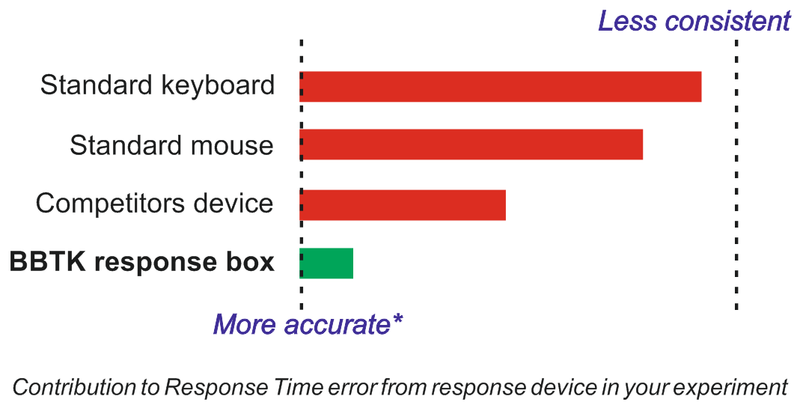 Our response boxes & response pads aim to reduce inconsistencies and improve your Response Time accuracy compared with using standard keyboards, mice or competitors devices. *Remember although our USB response boxes hardware is millisecond accurate and helps reduce RT variability in your experiments it cannot automatically correct for any mistimings that are inherent within the experiment generator or other hardware you use. For self-validation you should independently check the accuracy and consistency of your experiment generators presentation and response timing, or system as a whole, with a Black Box ToolKit v2 together with a BBTK USB response box. For sub-millisecond TTL event marking of stimuli and responses, you should combine our response box with a mBBTK v2. The unique mBBTK v2 takes over all timing duties from any experiment generator so you can be 100% sure of your presentation, synchronization and response timings. The four port USB response box is used in custom applications where high accuracy and reliability is required and our 1-8 button USB response pad is unsuitable. It can be used with high quality push-to-make buttons/momentary switches, or hand-held triggers, such as Piko buttons or our own hand-helds. For event marking a single TTL lead is provided which outputs a 50ms pulse aligned with a button press. Due to its small size and our ability to produce a cross-branded versions it is ideally suited to fit and forget applications where high reliability is needed. Note: no buttons are supplied by default. #This can add 50ms to key down durations – onsets or RT's are unaffected as these are sent to the host PC immediately. ALL standard keyboards and other response boxes typically have longer debouncing periods. *Remember although our USB response boxes are millisecond accurate and help reduce RT variability in your experiments they can't automatically correct for any mistimings that are inherent within the experiment generator you use. Hardware capable of sub-millisecond accuracy. Timing accuracy tied to PC or experiment generator used. Unless otherwise labelled, all products offered for sale by The Black Box ToolKit Ltd are for academic study and/or research use only.